One eye on the road. One eye in the rear view mirror. 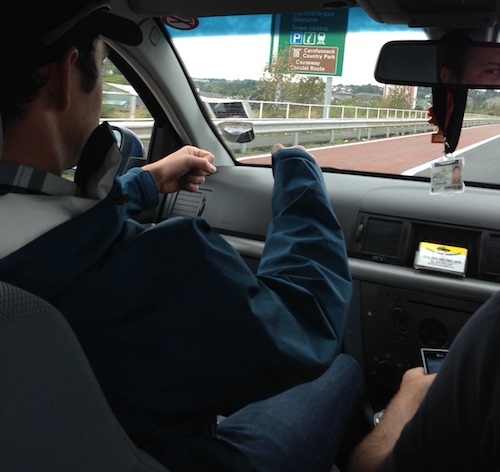 One hand steering. One hand texting. One hand shifting. Impressive. After taking the 2 hour ferry ride from Troon in Scotland to Larne in Northern Ireland we hired the only cab waiting there to get us to Belfast which is 40 minutes away. This is where we met Ray. From the second we got into the cab Ray was texting and calling people trying to find somebody to pick up his kid in 15 minutes from school all while shifting gears. He had to call another cab company which forced him to write down the number, shift, and hold the cell phone. I offered to help but he turned me down. Impressive how he was able to do all of that while not putting us into the guard rail. Ray brings up politics. I am not sure on how I want to approach responding yet as he gives me a back history about “The Troubles” of Northern Ireland and being apart of the UK. There was a very “Governmenty Feel” the second we got off the boat so I had a feeling where this was going. Ray: Every person receives £2,000 ($3,200) a month to cover living expenses as long as they are looking for work. Ray: They have to fill out a piece a paper and turn it into the Government saying they are. Me: I bet there is a 100% honesty guarantee rate too. Me: Ray, if you gave me that much money a month I’m sure I can find a room to rent out with a couple of friends for £400 a month including utilities. Probably spend another £400 on food and entertainment. Kick in another £300 for cell phone and miscellaneous items. That leaves me £900 a month for whatever. Do you know how much traveling you can do with that kind of money? I could travel the world slowly and cheaply with that kind of money every month. If this isn’t the first thing coming to your mind at the age of 18-24 then their lying. And then to know that it continues on forever. Why even look for real work? **The way Ray explained their welfare was it was given to everybody (like healthy young adults w/o kids) indefinitely. Not like here in the U.S where you get unemployment for 6 months (indefinite now I guess) or you’re a single parent. Ray: Our system is so much better than yours in the U.S. We don’t pay for visits. Let’s say I nick my knee playing rugby with my mates. I call up the Doctors office and they give me an appointment IN SIX MONTHS. Me + Andrea: HHHHOOOOOLLLLLYYY SSSSHHHHIIIIITTTT!!!!!!!!! Ray: (Deer in headlights) If I say it’s really bad they bump me up TO THREE MONTHS. Me: Ray, that is not a better system. You think your leg is bad you go to the Drs. that day. Waiting 6 months is not better. Geez. How is this system funded if its free? Ray: Well, our taxes on gasoline cover the cost. Money collected goes into a coffer and its paid that way. Me: Like – how much taxes? Ray: It’s basically double the cost of a gallon of gas from what you pay in the U.S.
Me: HHHHHOOOOOOLLLLLLLYYYYY SSSSHHHHHHHIIIIITTTTTTTTT!!!!! (Could explain why we did not see one truck in the U.K. Not even on a farm). Do you like paying double for gas? I mean, since you’re a cab driver it must eat into your wages. Ray: Its easy with the Government running the healthcare system so I don’t mind. Me: (Facepalm) Are there any private Doctors? What happens if they can’t see you in six months? Ray: There are private Doctors but you have to pay to see them. If the NHS can’t get to your appointment then they pay to send you to one of the private Doctors. Me: So all the Doctors work for the NHS. Ray: (Deer in headlights) No – the NHS only pays them if they can’t get to you. Me: If they accept money from the Government then they are no longer a “private Doctor.” They are Government employees. Ok, maybe you can call them “semi-private.” I can picture some private Doctors who don’t even try to bring in patients but just wait around to take care of the ones who can’t be seen by the NHS. Ray: There is no need for the average person to have guns. The police are there to shoot the bad guys. And look at all the massacres that go on in the U.S.
Me: Most – if not all – of those massacres happened in Gun Free zones. This means Ray that no one is allowed to have a gun. Even security. If you were going to commit a massacre would you risk walking into one of the 50 million or so homes in the U.S that have guns or would you instead go after areas that you know for a fact do not have guns? Me: I keep a couple of guns in the house for protection. The thing is Ray that if I do need the cops to shoot the bad guys it is already too late. If you could protect your family would you leave it to chance? I’ve never really felt threatened going out and I live two miles away from the third most violent city in the U.S. Would there be less massacres if security in the gun free zones were allowed to carry guns? Maybe. Me: But the real question nobody is asking is lets say the 2nd Amendment is revoked and nobody besides the Government is allowed to have them. Do you honestly think 50 million gun owners are just going to walk up to the cop shop and say “Hey, here are my guns.” Come on Ray. The 2nd Amendment was not put into the Constitution to give us a chance to protect us from bad guys. It was put in to protect us from the Government. At that time we pulled up in front of our hotel and I ended it with this. Me: The federal Government running anything (besides military) is not allowed in a free society. None. It’s never easier or convenient to have the Government run anything. I told him we enjoyed the ride and asked him for some ideas on what to do In Belfast. He gave us a couple of ideas and we parted ways. Ray was a very nice guy and at no time did he raise his voice or tell me I was wrong. I think most of the things I said he was hearing for the first time. Later that night I was thinking about how crazy some of the things Ray said were. Double the price for gas. Up to 6 months to be seen by a Doctor. Welfare for everybody. Illegal to own a gun. I mean, crazy, right. Nobody would ever fall for that stuff here in the U.S. It then occurred to me that gas taxes aren’t that high here…yet. Medicare and Medicaid are already in place and are a huge CF on the Federal Budget and on taxpayers. With Obamacare passing its merely a matter of time before our entire health care system turns into theirs. I don’t think the U.S Government will have any luck de-arming the citizens as they are far outnumbered and you can’t do it electronically. Here I am thinking everything Ray said is crazy (it was) but the groundwork for the U.S Government to get taxes raised or additional laws passed is already in place. While a majority of people aren’t in favor of the federal Government running everything right now they are however ok with it running somethings. Its only a matter of time before the majority starts to think like Ray. I couldn’t find firm #’s regarding Ray’s welfare statement or what % of gas taxes go to funding the National Healthcare System. Everything I found said they were funded by “general taxes.” (Bonus – European Governments have been frauded (LOL) $4 billion in taxes due to black market gasoline.) I knew British citizens were not allowed to have hand guns due to the 1997 Firearms Act. 57,000 people (.01% of population) did turn over their guns to the cops. There are 130k people that still own shotguns. Going back to my point though. It would be easy to convince .01% of the UK population to give up their guns rather than the 50% of Americans.